Students at the University of the Fraser Valley are welcoming the elimination of interest from B.C. student loans as part of Budget 2019. This decision will help alleviate the burden of debt for 200,000 people. B.C. student loans stopped accumulating interest, effective Feb. 19, 2019. 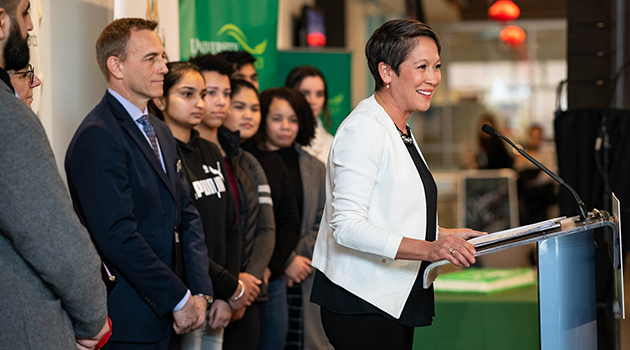 Melanie Mark, Minister of Advanced Education, Skills and Training, was joined by students, representatives of the student union society and UFV President Joanne MacLean at the student union building to mark the historic announcement. Students have advocated for interest-free loans in B.C. for many years. The elimination of interest on provincial loans levels the cost of education for everyone – students who cannot afford to pay up front, and who rely on student loans, will no longer pay more for their education than those who do not need the assistance. There are 200,000 B.C. student loans representing $1.24 billion in principal outstanding. Borrowers will collectively save about $22 million in interest payments on these loans in 2019-20. The elimination of interest on student loans means that low- to middle-income students are not paying thousands of dollars more for their education than their peers who can pay up front. Eliminating interest on provincial student loans will not only benefit current and future students. The effect will be felt by borrowers who are still paying off their student loans and accruing debt. A typical undergraduate borrower has $11,200 in B.C. student loan debt, and $28,000 in total student loan debt, including both federal and provincial loans. Eliminating interest on the provincial debt will save this typical borrower $2,300 over the 10-year repayment period. * The announcement in Budget 2019 to eliminate interest on B.C. government student loans comes after years of advocacy by student groups throughout the province, including the BC Alliance of Students and the BC Federation of Students. * The UFV Student Union Society is a non-profit organization run by students and for students at UFV. Through a body of elected student executives, faculty representatives, hired student staff and a small group of permanent staff, the society is able to offer services to its members, advocate for post-secondary education on their behalf, connect them with student clubs and associations, and provide them with many opportunities to get involved on campus. * StudentAid BC delivers the Canada – British Columbia integrated student financial assistance program. The federal government sets the interest rate for the federal component. Interest on the federal loan remains prime+2.5%. Integrated loans are based on a 60/40 split between federal and provincial funding, respectively. * The 200,000 B.C. student loans include about 55,000 people in study, about 120,000 people in repayment and about 25,000 people in default. * The student loan interest rate in B.C. had been prime plus 2.5% since 1996-97. Government first reduced interest from prime plus 2.5% to prime on Aug. 1, 2017.